Fire safety systems and equipment are required to be installed at buildings and public places to ensure safety of people and to prevent major loss due to fire incidents. The demand for fire safety systems and equipment in middle east region is likely to witness substantial growth over the coming years as these equipment are mandatorily installed in almost all the sectors due to stringent regulatory norms as well as strict implementation & monitoring systems. According to 6Wresearch, Middle East Fire Safety Systems and Equipment market size is projected to grow at a CAGR of 7.8% during 2018-24. Middle East Fire safety systems and equipment market forecast period revenues are anticipated to grow due to rising construction activities and installation of fire safety equipment in public places, residential apartments and offices. Several projects across several Middle East countries were put on hold after the oil price crash in 2014 which had a negatively impacted he growth of the fire safety systems and equipment market in Middle East region during the last few years. Commercial and hospitality sectors are the key verticals that are driving the demand for fire safety systems and equipment such as sprinklers and suppression systems. Upcoming mega events such as the Qatar FIFA World Cup 2022 and Dubai World Expo 2020 would lead to the development of the infrastructure sector in these countries which in turn would help drive the market of fire safety systems and equipment. In the overall Middle East fire safety systems and equipment market share, Saudi Arabia and UAE have generated key revenue shares. The Middle East fire safety systems and equipment market report thoroughly covers the by type, verticals and countries. 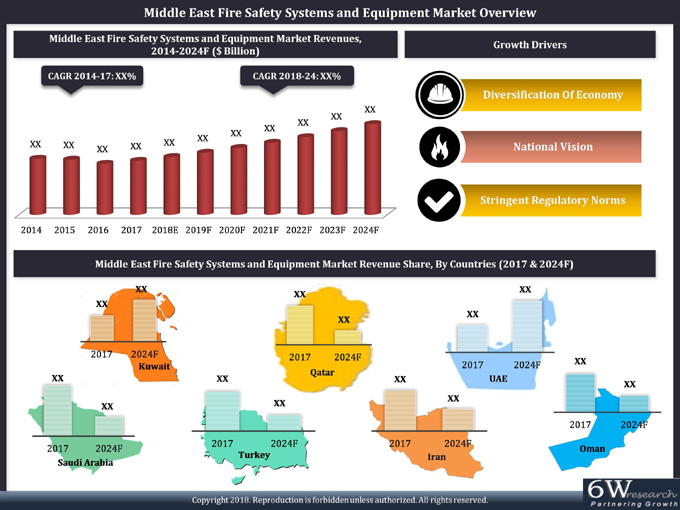 The Middle East fire safety systems and equipment market outlook report provides an unbiased and detailed analysis of the on-going Middle East fire safety systems and equipment market trends, opportunities, high growth areas and market drivers which would help the stakeholders to device and align their market strategies according to the current and future market dynamics. • Historical Data of Middle East Fire Safety Systems and Equipment Market Revenues for the Period 2014-2017. • Market Size & Forecast of Middle East Fire Safety Systems and Equipment Market Revenues until 2024.
and Equipment Market Revenues for the Period 2014-2017. Systems and Equipment Market Revenues until 2024. Systems Market Revenues for the Period 2014-2017.
and Alarm Systems Market Revenues until 2024. Lighting Market Revenues by Verticals for the Period 2014-2017. Exit Lighting Market Revenues until 2024.
and Equipment Market Revenues by Verticals for the Period 2014-2017. Systems and Equipment Market Revenues by Verticals until 2023. • Middle East Fire Safety Systems and Equipment Market Trends and Developments. Safety Systems and Equipment Market Overview on Competitive Benchmarking. • Competitive Landscape and Company Profiles. 63.5. Saudi Factory For Fire Equipment Co.